The fact that John Marston couldn't swim in the original Red Dead Redemption has become the stuff of gaming legend, with the character's distaste for getting his boots wet making the title's map a bit of a nightmare to traverse. 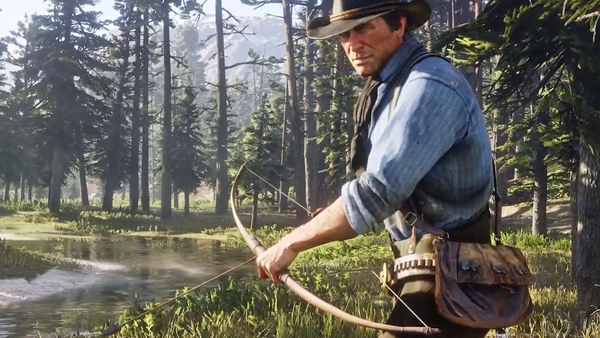 However, while it hasn't been totally confirmed that new character Arthur Morgan will be able to swim through the open world, it has been heavily hinted at in the new trailer. When showing off the weather and different environments, a brief clip showed Morgan wading through a swamp, with water up to his waist. It's unclear at the moment whether or not the game will have fully-detailed underwater areas like in GTA V, but at the very least players should have more ways to explore the frontier than on land.